I am very fortunate to be born in Laxmangarh, the tapobhumi (land where austerities are performed) of Shri Babaji Maharaj. I was in grade eighth and used to go to a local school. This school was conducted at chudiwalon ki chhatriya (monument at the cremation ground of chudiwale). During those days, Shri Babaji Maharaj used to stay at chhatriya whenever he came to Laxmangarh. One evening, along with other disciples, I was with Shri Babaji Maharaj. He sent off everyone and asked me to sit with him. It was getting darker and Shri Babaji Maharaj asked me “Will you go to Ghanshyam Vyas’s house and bring back an oil lamp?” I said yes, to which Shri Babaji Maharaj said “don’t break the glass”. At Ghanshyam’s house when I was taking the glass off, it broke. I ran to the market and brought a new glass and was soon in front of Shri Babaji Maharaj. He smiled and said “so you broke the glass”. I was surprised over this as to how did he come to know about it? I understood that Shri Babaji Mahararaj knew every thing; there was nothing hidden from him. In my heart I immediately accepted him as my spiritual guru. Since that day I have been under the grace of Shri Babaji Maharaj. In 1988 my father was admitted in the Sikar hospital. He had an abscess in his liver and was in great pain. Doctors had given up hope and told my father to pray to God. During the evening prayer, when I was sitting with Shri Babaji Maharaj, he told me without me telling him anything “don’t be in despair, be strong. Shri Nathji Maharaj will take care of everything”. I was surprised as I had not mentioned anything about my father, but he knew everything. By his grace, my father got well soon afterwards. My brother got married in 1976. During the time of his wedding I got seriously ill and there was no chance of me surviving. Doctors had also given up hope. In the night, when my situation became worse, my younger brother, Ramesh, went to Shri Babaji Maharaj’s ashram. He reached early in the morning at 4am and told Shri Babaji Maharaj that Sushil’s (my name) condition is bad. Shri Babaji Maharaj said “take him to Richpal doctor”. Doctor came in at 8am and gave me the medicines and by 10am I came out of my room, feeling very fine. For the last ten days I had not eaten but all of a sudden I felt so much energy that I was now strolling outside. All the family members, although worried about me walking around, were completely surprised. In 1996 my son Gaurav caught Dengu (fatal viral fever). Doctors gave up hope and removed blood and platelet transfusion as it was ineffective. Shri Mahabir Pareek was sobbing looking away from the bed and Gaurav was lying unconscious and helpless. Maluramji and I had been there, by the side of Gaurav, for the last three days. We had not even had time to take bath for last three days so we decided to go for our bath. During bath all of a sudden we felt a jolt and ran back to the hospital. When we reached hospital, I felt very sad looking at Gaurav’s worsening situation and Shri Mahabirji’s tears. That moment, I saw a glimpse of Shri Nathji Maharaj near Gaurav’s head. I told Shri Mahabirji that now nothing will happen to Gaurav as Shri Nathji Maharaj has come. Gaurav got well very soon afterwards. Doctors and nurse were surprised to see this and immediately started blood and platelet transfusion. By the grace of Shri Nathji Maharaj, Gaurav soon got completely well and in fact was blessed with a new life. My younger brother, Ramesh, was working in Bangalore. There he came in contact with Prajapita Brahmkumari organisation. He got very attached to this organisation and his state was such that at that time he would not listen about any other organisation except Prajapita. He started following the path laid out by Prajapita organisation. One day during prayer time I took Ramesh to Shri Babaji Maharaj. 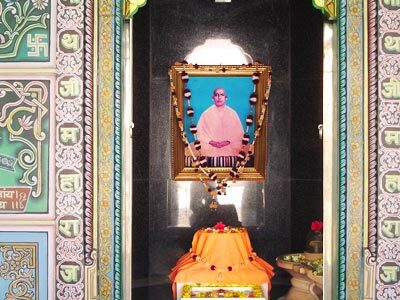 Although I had not told Shri Babaji Maharaj about Ramesh, after prayers Shri Babaji Maharaj called Ramesh and asked him “your entire family is devoted to Shri Nathji Maharaj but how is you have started following Prajapita Brahmkumari organisation?” Despite Shri Babaji Maharaj’s advice Ramesh stuck to his position. Then Shri Babaji Maharaj, who is full of pity, said smilingly “from today onwards no one should try to convince Ramesh to leave his path. After few years he will, on his own, give up his liking for Brahmkumari organisation, he will earn well and will also get married”. From that day onwards, as per Shri Babaji Maharaj’s instructions, we never talked to Ramesh to give up his association with Prajapita. Over a time he on his own gave up his association with Prajapita organisation, started earning well and also got married. This all happened due to grace of Shri Babaji Maharaj.